Express your inner guru with the ultimate Yoga Keyboard and Sequence Notepad – YOGOJI. YOGOJI is the easiest way to quickly notate your yoga sequences and massively ramp up the fun factor of your text messages and emails. - 400+ unique yoga icons ranging from spiritual kitsch (think dream catchers and bindis) to every yoga pose it's possible to pretzel yourself into. - Install the YOGOJI Keyboard on your iPhone and make every text message and email lol-worthy. 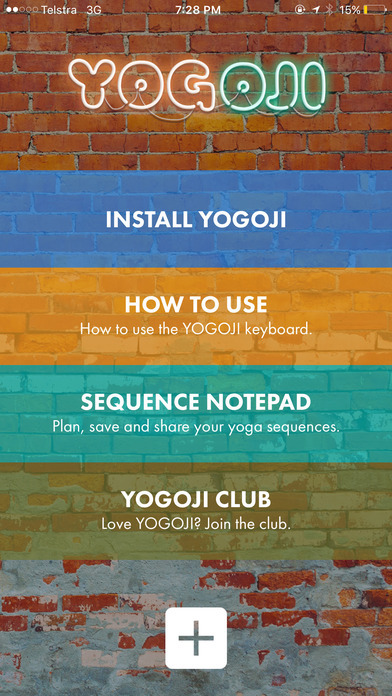 - YOGOJI's Sequencing Notepad is the quickest way to plan, save and share your yoga class sequences. Use it as a tool to plan your home practice, or to teach others. 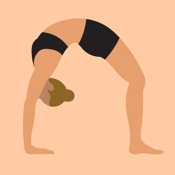 - YOGOJI icons are grouped by category: standing, prone, seated, supine, arm balances, backbends and inversions – and then by level of difficulty. Silky smooth sequencing just became a cinch. - Tap and hold any asana in the Keyboard to view both names. Select either one and it'll display with the YOGOJI for quick recall. Packed with attitude, a quirky sense of humour and a healthy (ir)reverence for the practice, YOGOJI really is the ultimate yoga accessory. So fool around and make it your own. Sure, use it as a tool to improve the study of your practice, but most of all, have fun! YOGOJI is compatible with iPhone 5 and above.